Very closely related to the popular edible fungus Cantharellus cibarius and equally delectable, this purple or violet tinged chanterelle is a rare to occasional find in Britain and elsewhere in Europe, where it usually grows under hardwood trees, particularly oaks. Chanterelles of various kinds are world famous not only because they are so good to eat but also because of their appearance in so many countries. In Europe they occur from Scandinavia to the Mediterranean. This amethyst-coloured chanterelle seems to be rather more common in southern Europe, although it is reported from countries as far north as Sweden and Norway. In the south of France these mushrooms can be gathered until Christmas unless the winter is particularly harsh, while in the Algarve region of Portugal they don't really get going until late November and we have been able to find them right through the winter until the weather gets too hot for fungi at the end of March. 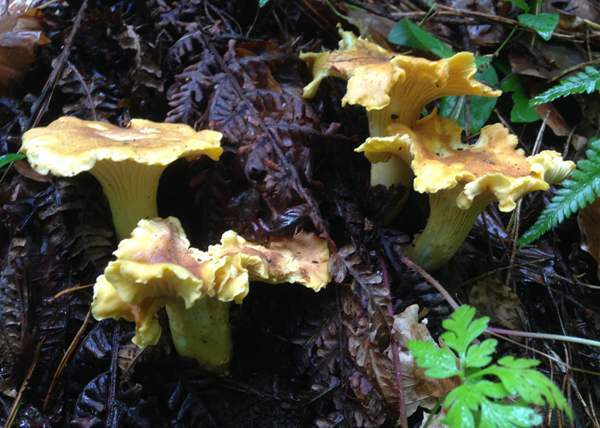 A similar chanterelle is found in parts of North America, but it is unclear whether this is co-specific with Cantharellus amethysteus found in Europe. 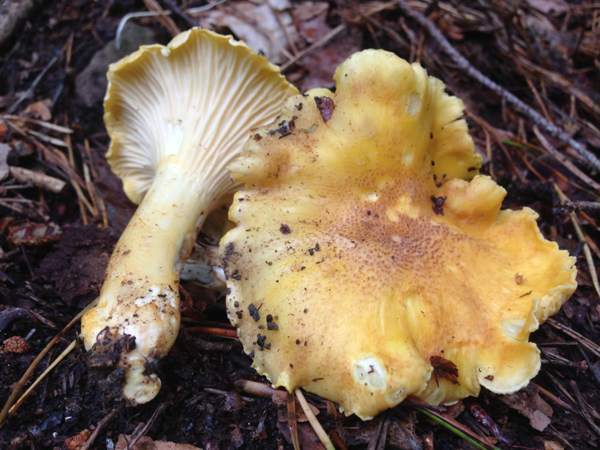 Given its currently accepted scientific name in 1887 by Italian mycologist Pier Andrea Saccardo, this woodland mushroom was first described scientifically by the famous French mycologist Lucien Quélet, who initially treated it as a variety of the golden chanterelle of summertime, naming it Cantharellus cibarius var. amethysteus. Synonyms of Cantharellu amethysteus (Quél.) Sacc., include Cantharellus cibarius var. amethysteus Quél., Craterellus amethysteus (Quél.) Quél., and Cantharellus amethysteus var. substypticus Bon. The specific epithet amethysteus refers, of course, to the purplish-lilac (amethyst) coloring of scales on the upper surface of caps of these mushrooms. The cap, of diameter up to 10cm, is initially flat topped but usually becomes centrally depressed and often develops an irregular wavy margin. 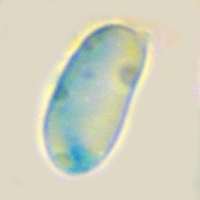 Background colour varies from light yellow to deep egg-yolk yellow but with an overlying purplish or amethyst scaly layer, generally paler towards the downturned or inrolled margin. Not strictly gills at all, yellow wrinkled veins on the underside of the cap comprise the fertile (spore-producing) surface. The veins are very thick and decurrent, extending well down the stem; they are straight near to the stem but forked and more sinuate towards the edge of the cap. The stem is usually somewhat paler than the cap, 1 - 2cm in diameter, often no more than 2cm long, and merging into the cap. 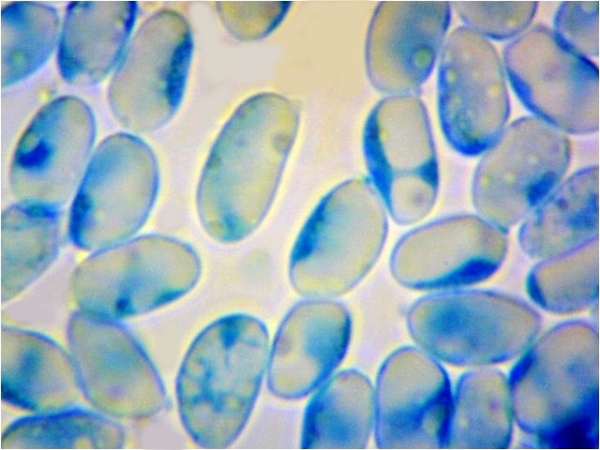 Ellipsoidal, smooth, 8-10 x 5-6µm; inamyloid; hyaline (translucent and glass-like) in KOH. Pale yellow, sometimes with a slight pinkish tinge. This ectomycorrhizal species can usually be seen fruiting in small groups in deciduous forests, often with oaks, beeches or birches. Very occasionally these mushrooms are found under pines. 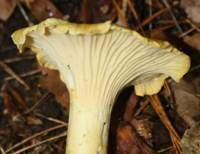 The Chanterelle Cantharellus cibarius has a yellow or golden cap. The rich fruity aroma (like apricots, many people say) and pleasant texture of cooked chanterelles are one of Nature's culinary delights. Cantharellus amethysteus can be considered identical to Cantharellus cibarius as far as cooking is concerned.. The Chanterelle is one of our 'Magnificent Seven' and there are recipes for taking advantage of such marvelous mushrooms in Chapter 10 of Pat O'Reilly's new book Fascinated by Fungi... If you have never tried cooked these mushrooms before you are in for a real treat. What's more, because these woodland fungi have wrinkles rather than gills on the fertile (lower) surface of their curly and often contorted caps, getting to be competent at identifying them with certainty is not at all difficult. These mushrooms can be used in rissotto dishes and omelettes, and they certainly have enough flavour to make tasty soups or sauces to be served with chicken or fish dishes. Try our Salmon and Chanterelles main course recipe; you will love it!